Home > Blog > Uncategorized > 3 Things to AVOID as a Small Business Owner! Running a small business is serious shizzle. Working smarter not harder is the name of the game. Here at Spicy Broccoli, we’re taking some time to celebrate the awesome-ness that is Small Business Month! Small businesses make up 97.4 per cent of all businesses operating in Australia, and with over 2.2 million businesses in Australia as of June 2017… that’s a lot of small businesses! Starting your own business is a huge challenge, but what’s even more difficult is keeping it growing. As a small business ourselves, we know how much work goes into keeping your company on the path to success – and it’s certainly not easy! You may have seen our previous post, where our Founder and Creative Director, Sarah Taylor, shared some tips on how to succeed as a small business owner. Since creating Spicy Broccoli in her spare bedroom in 2009, Sarah has worked with over 400 small businesses, showing them how to take control of their business with effective branding and marketing strategies. Because we’re generous people here at Spicy HQ, we wanted to bestow Spicy Sarah’s wisdom upon you! This is why we asked her: What should small business owners avoid like the plague? What business practices are a recipe for disaster? 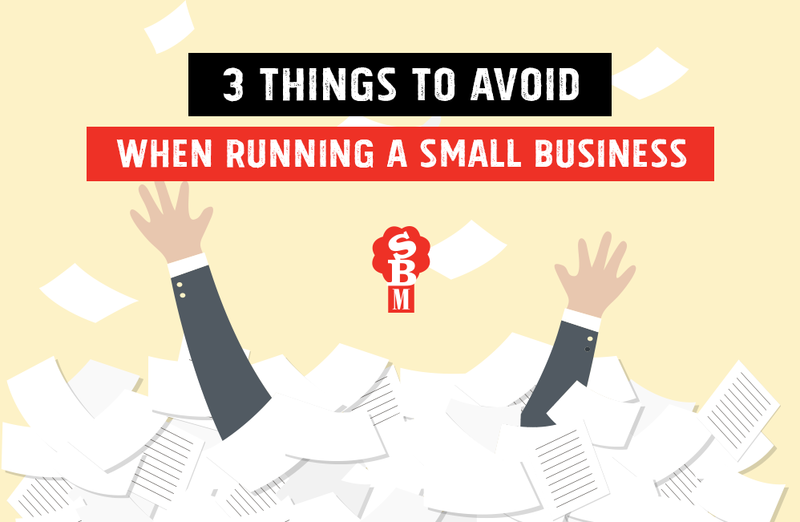 Here are Sarah’s 3 things to AVOID when running a small business! 1. Don’t be a One-Stop Shop! There are two key things you need to focus on when considering your business approach: who you’re targeting, and what your goals are . In terms of your audience, it’s essential to build customer avatars for your company and be clear who your target audience is. Speaking their lingo. When considering the product or service you’re pitching, make sure you target something specific instead of trying to solve every problem imaginable. Your marketing material shouldn’t be where you show off your business’ multi-tasking skills (we bet you’re really good at it, though!). We’ve all seen those ads where the audience is bombarded with information, and you end up forgetting everything just as quickly as it entered your brain. If you have multiple promotions, or more than one specific target audience, separate them! An unclear, uninformative marketing campaign is a huge waste of both time and resources, so make sure you do your research. The idea that you should be spending a significant portion of your profits on marketing seems unnecessary to some, but Sarah knows that every business should have a dedicated marketing budget if they want to see business growth. “20% of your annual turnover should be going towards marketing campaigns if you’re looking to grow your company. If you’re only looking to maintain your current customer base, 10% is sufficient.” It’s your job to attract customers – don’t expect them to do it for you! 3. Don’t Set It and Forget It! It’s 2018 – your website is a first point of contact for most customers, so you need to make a good impression! If you want to keep your audience interested, you need to be massaging your website with new content and continually checking your marketing campaigns to make sure they’re both effective and relevant. Keep reviewing and analysing your work, and get as much feedback as you can. Sarah’s warning to business owners is: “Don’t become complacent. Saying ‘well, people already know who we are’ is not a growth-oriented attitude. Current clients might know who you are, but what about your prospective ones?” Wanting to reach out to even more people should be a priority for a business that wants to continue growth. Think of your favourite brand – would they be where they were if they weren’t constantly refreshing and updating their marketing campaigns? The answer is probably no. No, wait, it’s definitely no. The common theme here is to be proactive: research, get feedback, and tailor your approach to keep as many people interested in your business as possible. It sounds obvious, but inaction is the enemy of progress! Keeping both existing and potential clients interested in your offerings is essential for your business’ longevity, so don’t underestimate the power of branding and marketing. Does your business need a branding boost? A fresh and funky (or even simple) new website? An exciting, eye-catching marketing strategy? Spicy Broccoli has got you covered – get in touch with us on our Contact Page, send us an email at info@spicybroccoli.com, or give us a call on +61 2 8084 5554!